Here at the MarTech conference in San Francisco, we just celebrated the 2017 Stackies & Hackies Awards. Marketers contributed an incredible 57 marketing stack illustrations and 21 “marketing hack” essays to the community. We also expanded the awards this year with the Hackies, inviting marketers to send in an essay describing a brilliant “marketing hack” that they’ve used at the intersection of marketing, technology, and management. To encourage entries, we agreed to donate $100 to Girls Who Code for every Stackie or Hackie published. So this evening we were pleased to present them with a check for $7,800 (57 + 21 * $100 = $7,800). The top three winners of the Hackies were determined by the number of social media shares those essays received — plus we also gave out an Editor’s Choice award to the one our editorial teams liked best. Of course, all that really matters about a marketing stack is whether its effective for your business. So while we are happy to give a shout out to some of the stacks we liked best, all of the entries are extremely valuable — they give all of us a rich corpus of real-world marketing stacks, viewed through a variety of insightful lenses. This helps all of us better understand the reality of modern marketing technology operations and learn from each other. Allocadia has championed a “run marketing” and “do marketing” duality to the structure of marketing operations and execution — the behind-the-scenes management of the department (“run”) and front-office marketing that touches prospects and customers to attract, acquire, and retain them (“do”). 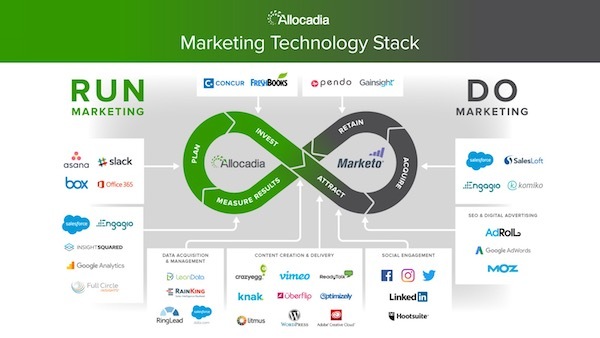 They’ve organized their stack around the loops between these two intertwined capabilities, featuring their own product at the heart of “run” and Marketo at the heart of “do.” It’s great to see marketing connected with sales and finance through their stack as well. Aprimo rendered their marketing stack along two dimensions — (1) a continuous loop of plan, spend, create, distribute, and perform and (2) concentric circles within that loop of capabilities for marketing operations, content, website, social, demand generation, and data & sales enablement. 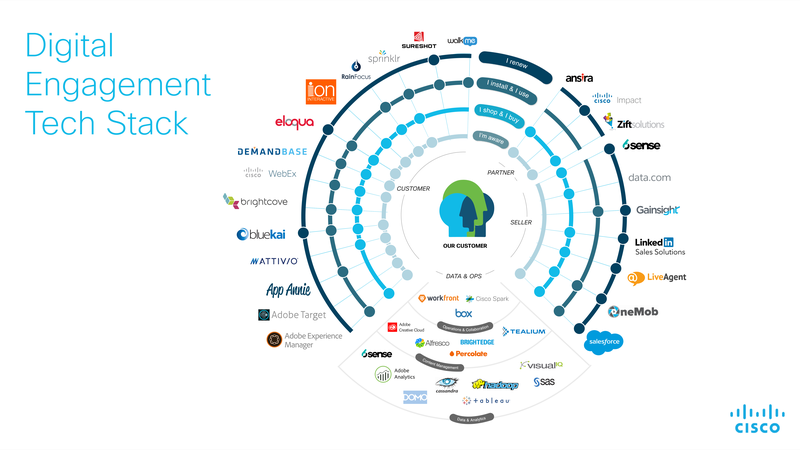 You can see how each of the marketing technologies they’ve selected (or built!) fit into this architecture. Of course, Aprimo is at the heart of the marketing operations circle, helping to coordinate and manage activities across all of the other circles. We already did a write-up on Cisco’s marketing stack when we first received it. It was very exciting to see how they organized their marketing technology at such a large enterprise. It’s an excellent example of a rich but rational marketing stack that serves a wide range of needs across the customer journey — including channel and direct relationships — for large, global brand, but without a lot of duplication or overlap. 39 marketing technologies on their slide, but each clearly has its place and purpose. Informatica presented their stack as more of a flow diagram, illustrating the exchange of data between different components in their marketing infrastructure — all connecting into a common marketing data lake. But their stack is also customer-centric, as their 10-step narrative for this data flow is written entirely from the perspective of the customer. It’s terrific transparency for how Informatica engages with its prospects and customers, in addition to being a great example of a highly synchronized marketing stack. We also did a write-up on Microsoft’s marketing stack a few weeks ago, when we first received their entry. Again, we were so incredibly grateful that a company of Microsoft’s scale was willing to share their marketing stack with the community. They organized their stack around the buyer’s journey as well, a continuous loop between marketing, sales, and post-sales marketing — but with three bands of technologies based around Gartner’s pace-layering model: systems of record, systems of differentiation, and systems of innovation. The Red Wing Shoes stack is awesome for several reasons. First of all, they’re not a tech company — so you get to see what marketing technology operations looks like at a consumer brand, especially one where they have the challenges of channel customers as well as the end consumer. They’ve arranged their stack to show which technologies interface with different stages — it’s truly a “stack” — as well showing the journey of reach, engagement, conversion, and retention with a feedback loop that they use to iterate and optimize. We also gave our Editor’s Choice award to Matt Parisi of Tealium. His “Beacons & Bacon” article was a really fantastic read. Thank you again to everyone who contributed! We’re incredible grateful for everything you’ve shared with the community. That is very interesting. But what about integrations? How are this platforms connected? Hi there! We want to share our Marketing stack, is it possible? That would be great! I’ll send you an email with my email.